The eNotebook provides the ability to share any level of your notebook (from a single figure to your whole notebook) with anyone you choose - students, supervisors, collaborators or fellow researchers. Collaborators may be external to the University and do not need a Unikey to view or contribute to your notebook. You are able to determine specific access privileges that allow collaborators to view or to edit or even to invite others to view/edit your notebook. All revisions to your notebook are kept in the revision history and all contributions are time stamped and attributed to the contributing author. Access of collaborators to your notebook can be removed easily at any point you deem appropriate. To share any entry, hover your mouse over the entry and click the settings cog symbol, then share, indicated below. To share any page, folder or the entire notebook, right click on the appropriate option in the Notebook Navigator, then click Share…, indicated below. In both instances, the following window will appear. In the Invite People tab, you can begin to type any email. Separate multiple emails with a comma or semi-colon. Below the Invite box, you can select to allow invitees To view or To edit. 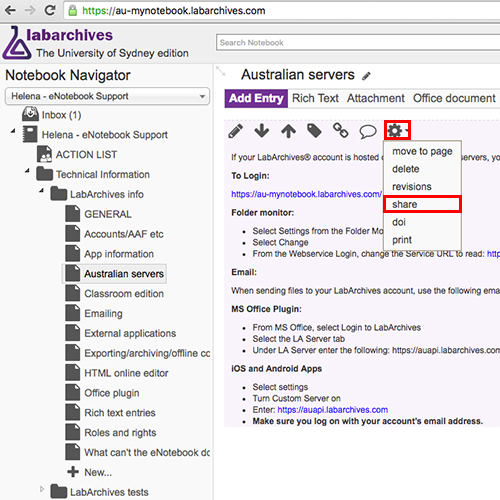 You may write a description that will be sent in the email invite to view/edit the notebook generated by LabArchives. Click Send to share. 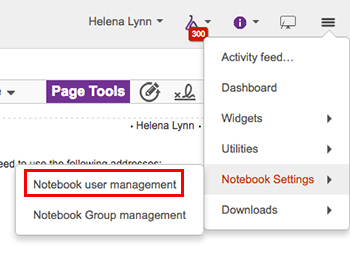 A summary of all users who have access to your notebook can be found by clicking the notebook settings button in the top right of the screen, then under Notebook Settings clicking Notebook user management. The following page will appear. 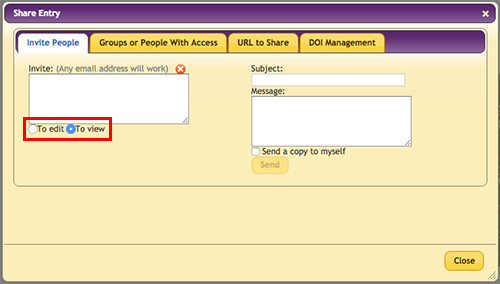 Here you are able to remove someone’s access as indicated or change their role in a drop down menu, also indicated. Newly added people will have a Guest role, you may choose to change them a User role or an Administrator role. The key difference with an Administrator role is that they themselves will be able to share the parts of your notebook that they have access to. Please note that the Notebook User Management menu outlined above controls access for that individual notebook only. 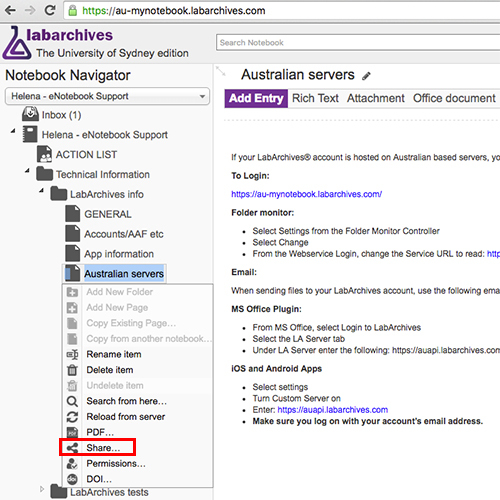 You are also able to alter user access across all your notebooks at once by clicking your name at the top right of the LabArchives window, then Manage My Account. Here you can view which of your notebooks any user has access to, and their role in each notebook. This may be useful if you have many notebooks and you wish to add or remove user access across all notebooks at once.